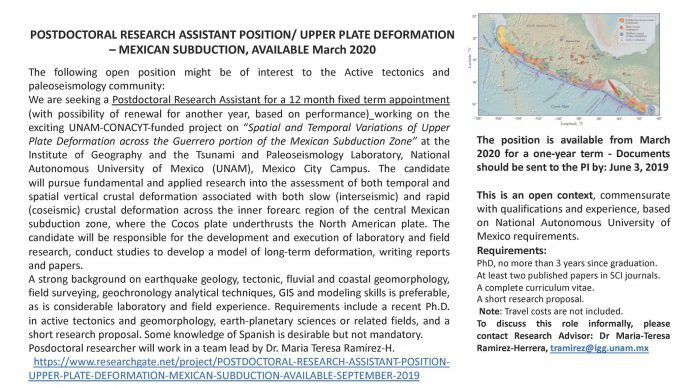 We are seeking a Postdoctoral Research Assistant for a 12 month fixed term appointment working on the exciting UNAM-CONACYT-funded project on “Spatial and Temporal Variations of Upper Plate Deformation across the Guerrero portion of the Mexican Subduction Zone” at the Institute of Geography and the Tsunami and Paleoseismology Laboratory, National Autonomous University of Mexico (UNAM), Mexico City Campus. The candidate will pursue fundamental and applied research into the assessment of both temporal and spatial vertical crustal deformation associated with both slow (interseismic) and rapid (coseismic) crustal deformation across the inner forearc region of the central Mexican subduction zone on the Guerrero sector, where the Cocos plate underthrusts the North American plate. The candidate will be responsible for the development and execution of laboratory and field research, conduct studies to develop a model of long-term deformation, writing reports and papers. A strong background on earthquake geology, tectonic, fluvial and coastal geomorphology, field surveying, geochronology analytical techniques, GIS and modeling skills is preferable, as is considerable laboratory and field experience. Requirements include a recent Ph.D. in active tectonics and geomorphology, earth-planetary sciences or related fields, and a short research proposal. Some knowledge of Spanish is desirable but not mandatory. Posdoctoral researcher will work in a team lead by Dr. Maria Teresa Ramírez-H. This is an open context, commensurate with qualifications and experience, based on National Autonomous University of Mexico requirements. 12 months postdoctoral salary (with possibility of renewal for another year, based on performance). Note: Travel costs are not included.